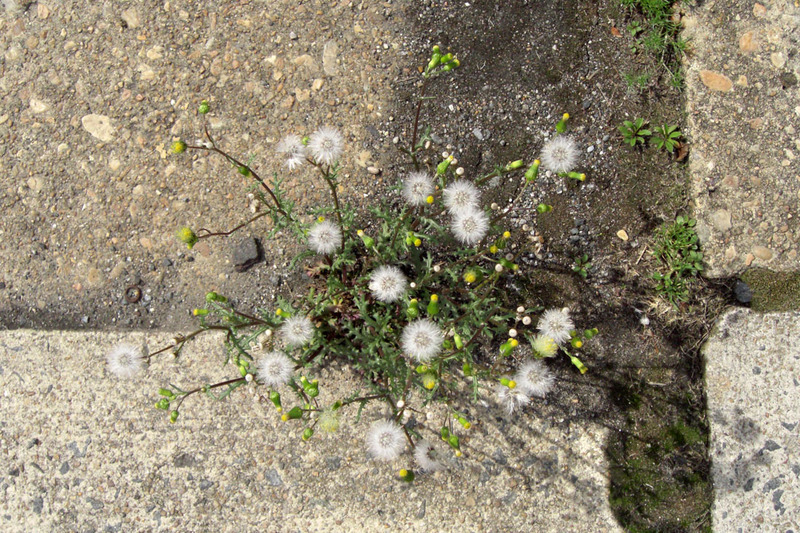 I stopped to admire a whorl of dandelions growing out of the gap in a neglected stretch of sidewalk. The seed heads glowed in the low-angled sunlight. They looked so magical, so delicate. One touch and their perfect fluffy roundness would crumble into almost-nothingness. Then each seed would set off on a journey, carried on a breeze, sure to find a new home on a lawn or in another promising sidewalk crack. They may not be welcome in our gardens but every child recognizes a dandelion’s enchanting beauty. 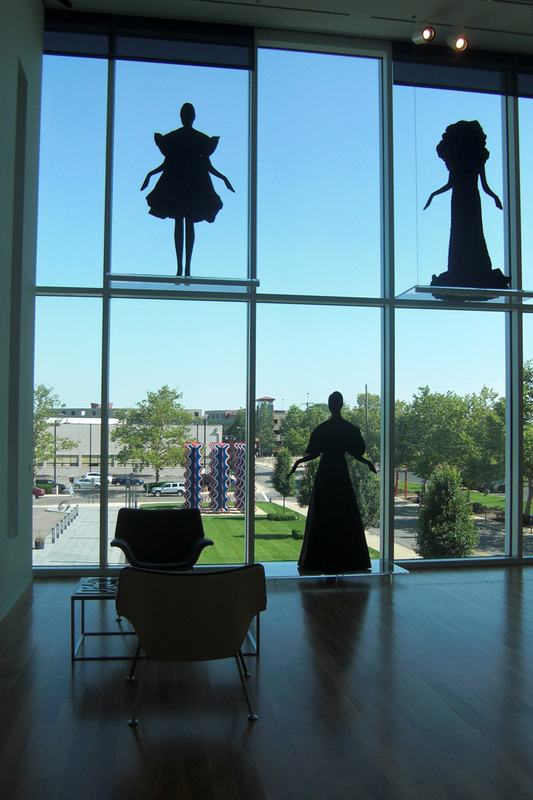 The year-old Schottenstein Gallery is a spectacular space for art. "Bodies @ Work: The Art of Ruben and Isabel Toledo" was the perfect installation for this roomy, light-filled space. It was an artistic collaboration and conversation, an interplay between Isabel's fashions and Ruben's large-scale paintings. Mannequins upholstered in black fabric wearing black dresses stood in the floor to ceiling window. They were silhouettes not only from this backlit viewpoint, but, because every detail was black, silhouettes as well from the outside. Up close, with the light flooding over them, viewers could appreciate the fine details of each garment, but shape was the most important element. If only I could share a dozen images. There was so much more...I will think about this exhibit for a long time. We all try so hard to be neat. Best selling books encourage us to tidy up, to organize our closets and drawers, to pare down our possessions. But there are times when this is not possible or may even be counterproductive. This is a work table in Pat Pauly's class at QSDS. 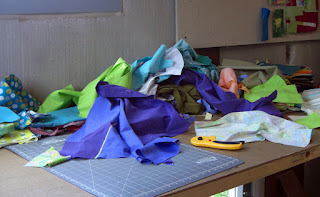 When you are in a a frenzy of cutting and sewing, striving to create an excellently composed art quilt, the last thing most of us want to do is stop and tidy up. Chaotically tossed fabrics can lead to discovering that two disparate prints really do work well together. An orange may land next to a violet and the pairing may sing. Tidiness is great but a bit of a mess can encourage creativity. 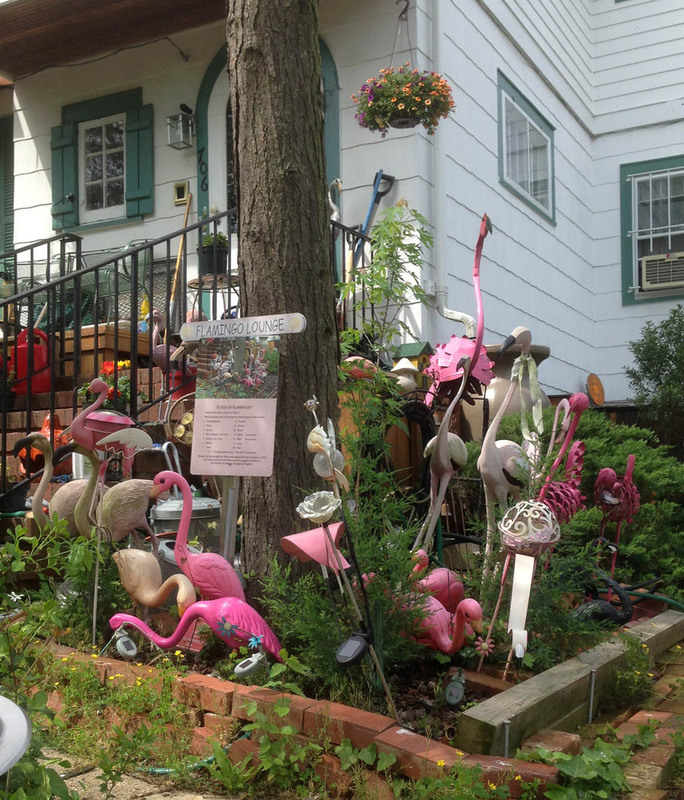 The folks who live here have heartily embraced the flamingo. They even put up a sign that helpfully informs passers by of the names of all seventeen of them. It reminds us that a group of flamingos is called a "stand" or a "flurry." 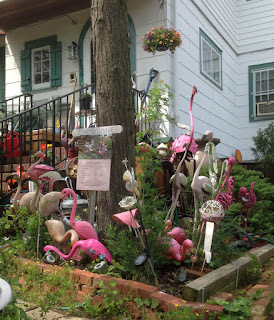 The "stand" part is pretty obvious, especially if your only contact with flamingos is seeing those of the lawn variety. Anyone who has seen a nature film showing how the world becomes nothing but a multitude of pink feathers when a population of flamingos all take to the air at once, will certainly understand why a group would be called a "flurry." Now that I've discovered them, I will make a point of visiting these flamingos more often.